For Senior Technical Assistant : Master’s degree in Chemistry/Botany/Zoology/ Environmental Science/Biotechnology or equivalent from a diagnosed university/Institute. For Lower Division Clerk : Twelve or equivalent qualification from a recognized Board with English Typing 35 w.P.M. Hindi Typing 30 w.P.M. Age Limit : As per IGNTU Rules. Selection Process : Selection will be based on Interview/Written Exam/Skill Test. Application fee : Candidate must pay Rs.500/- thru online Challan/Net Banking. 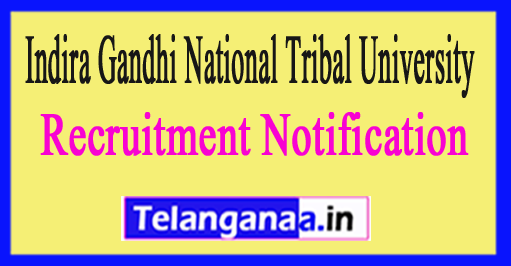 IGNTU Indra Gandhi National Tribal University Recruitment Notification 2017 The Post of 02 Consultant - Walk-in-Interview 20-06-2017. Educational Qualification - Master Degree in any Discipline. How to Apply- Interested candidate appear for Inter-view along with Bio-data/CV and experience at the time of Inter-view. Venue of Interview - Admin Building, Indra Gandhi National Tribal University, Amarkantak, M.P-484887. How to Apply - Interested candidates can send their CV to the e-mail ID: librarian@igntu.ac.in on or before 26.05.2017, and for birthdays with the Curriculum Vitae and original documents and self-certified photographs of certificates of qualifications, experience, trademark And box certificates, a passport size photos, etc. at the time of the interview.